Xylella fastidiosa is a bacteria that impacts a variety of plant species and in some regions is a threat to grape, almond, citrus, peach, alfalfa and coffee crops. It is less prevalent where winter temperatures are colder, such as at higher altitudes, farther inland from ocean influences and at more northern latitudes. Xylella fastidiosa is most commonly spread through the nursery trade by insects, mostly sharpshooters, which feed on infected plants with piercing or sucking mouthparts. Xylella fastidiosa manifests itself differently on its various hosts, depending on the bacterial strain. The bacterium multiplies and spreads within plants exclusively within the water-conducting tissues (xylem). 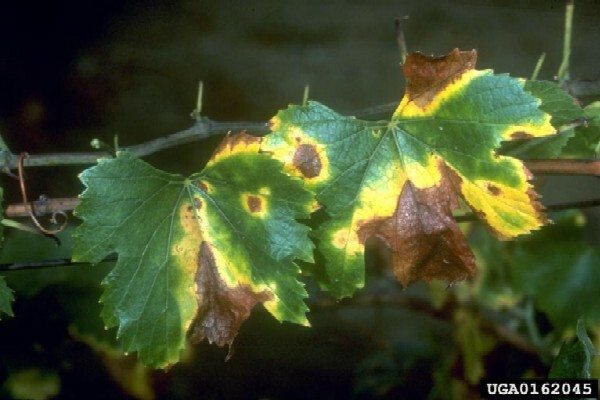 Pierce's disease of grape affects commercial grape cultivars by causing progressive, mostly marginal, yellowing (chlorisis) and discolouration of leaves, followed by leaf necrosis. In successive years, die-back of stems results in vine death. Grape species endemic to the bacterium's presumed region of origin (southeastern United States to Central America) are tolerant, harboring bacterial populations with no or only mild symptoms. Oleander Leaf Scorch causes yellowing of leaf edges, followed by tip leaf scorch (brown spotting), then die-back of twigs and branches. The disease seems to kill oleander within two years of the first appearance of symptoms. Almond Leaf Scorch causes marginal leaf scorch and dieback of twigs and branches. Leaf scorching is followed by decreased productivity and general decline of affected trees. The leaves exhibit yellow or white areas (chlorotic areas) as they lose chlorophyll either on the tip or on the sides of leaf blades, which eventually dehydrate and die. The scorched areas gradually enlarge over entire leaf blade, and affected leaves remain on the plant until fall defoliation. Trees become less productive, decline progressively, and often die within 3 to 8 years after the onset of leaf symptoms. Alfalfa Dwarf Disease causes a gradual decline in the rate of re-growth after cutting; compared to healthy plants, diseased plants have as little as a third of the normal re-growth after cutting. Diseased plants have smaller, darker (often with a bluish colour), and slightly more upright leaflets than healthy plants. Cutting the taproot of chronically infected plants diagonally will show wood that is slightly yellow with streaks or flecks of dark brown, dead wood instead of the normal white colour without dark streaks. 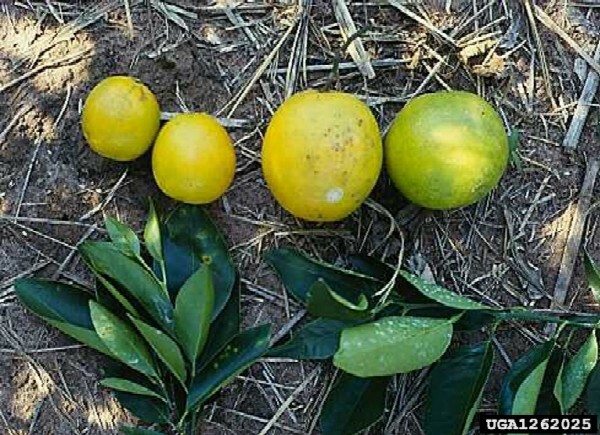 \r\nCitrus Variegated Chlorosis (CVC) affects all seed orange varieites (Citrus sinensis). It causes chlorotic yellow spots that appear on leaves of affected trees. On the lower side of the leaf, lesions with extruded gum often occur opposite the chlorotic spots that are on the upper side. 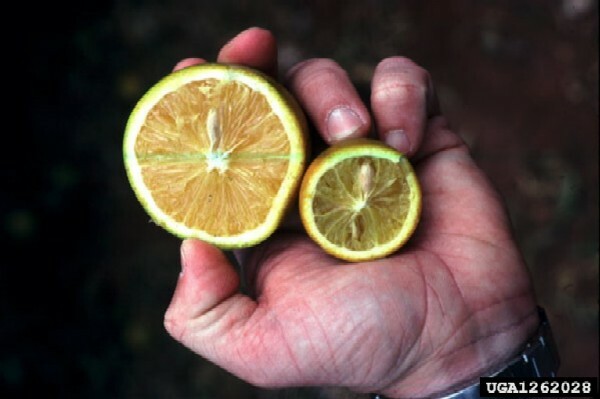 Fruits of infected citrus trees are much smaller than normal and extremely firm. In affected trees, growth rate slows, twigs and branches die back, and the canopy thins, but infected trees do not die. Phony Peach Disease causes stunting of overall growth of leaves (dwarfed), branches, and fruit; leaves become darker and flatter. Bacterial leaf scorch of coffee causes slight stunting, marginal or tip scorch of leaves, dieback of leaves and twigs, and leafless and fruitless side branches except for a tuft of leaves at branch tips. Leaf scorch disease in pear (Pyrus pyrifolia) causes the eventual dieback of twigs and branches, and in severe cases, death of infected trees. Symptoms are best observed during the summer and fall in Taiwan, where the disease has been discovered. 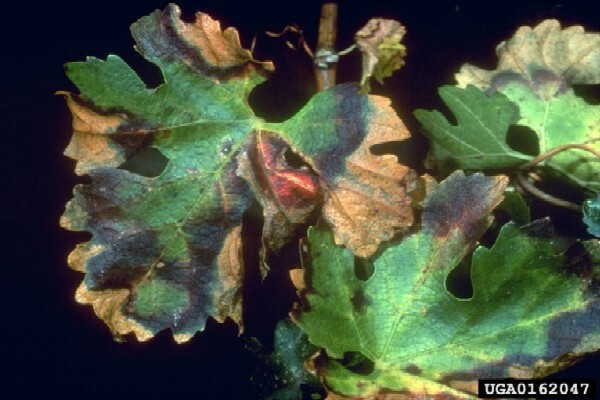 Maple leaf scorch, mulberry leaf scorch, bacterial leaf scorch of elm, bacterial leaf scorch of oaks, and bacterial leaf scorch of sycamore causes marginal leaf scorch and dieback of twigs and branches. Because of quarantine restrictions and the great number of possible host-strain combinations, the effects of various strains in all pathololgical hosts have not been tested. The bacterium can persist in symptomless host plants if it able to move systemically within the plant. Please see PaDIL (Pests and Diseases Image Library) Species Content Page Bacteria: Citrus variegated chlorosis for high quality diagnostic and overview images. According to Agricultural Research Services (2002), the citrus strain of the pathogen can infect grapevines and produce symptoms that are indistinguishable from those of authentic Pierce’s Disease. This is surprising to scientists because the two strains are quite different genetically. Results suggest that an inadvertent introduction of the citrus strain of X. fastidiosa into California would threaten both the grapevine and citrus industries there. However the grapevine strains of the pathogen apparently cannot induce Citrus Variegated Chlorosis disease. Citrus has been grown on a large scale for more than a century in both California and Florida in the presence of Pierce’s Disease and the citrus disease has never been reported. The same strains of X. fastidiosa that cause alfalfa dwarf can also cause Pierce's disease of grape and almond leaf scorch (Purcell 2001). According to Campbell et al. (1999), bacteria reproduce asexually using binary fission. Binary fission is a type of cellular division in which each dividing daughter cell receives a copy of the single parent chromosome. Growth is slow compared to most other enteric bacteria. Growth of X. fastidiosa colonies may be extremely rapid if their required resources are not limited and the colonies do not poison themselves with the accumulation of their own wastes (Campbell et al. 1999). Although considered a fastidious bacterium to culture on artificial medium, Xylella fastidiosa can grow well on a simple, chemically defined medium containing mainly amino acids (especially glutamine) and salts of weak organic acids such as succinate ro citrate. Purcell, A. H. 2001. Xylella fastdiosa Web Site. University of California at Berkeley. Recommended citation: Global Invasive Species Database (2019) Species profile: Xylella fastidiosa. Downloaded from http://www.iucngisd.org/gisd/species.php?sc=326 on 21-04-2019. Purcell (2001) states that Xylella fastidiosa is transmitted from diseased to healthy plants by insects with piercing or sucking mouthparts, such as sharpshooters, which feed on xylem (plant tissue that transports water and minerals from roots). X. fastidiosa causes a variety of plant diseases: Pierce’s Disease, Oleander Leaf Scorch, Phony Peach Disease, Almond Leaf Scorch, Alfalfa Dwarf, Citrus Variegated Chlorosis, bacterial leaf scorch of oak, leaf scorch disease in pear, bacterial leaf scorch of coffee, maple leaf scorch, mulberry leaf scorch, and bacterial leaf scorch of elm. Pierce’s Disease has become a major problem for the grape industry because of its invasive insect host, the glassy-winged sharpshooter (Homalodisca coagulata). This new vector is a serious, new threat to California vineyards because it moves faster and longer distances than native sharpshooters. It inhabits citrus and some woody ornamentals in unusually high numbers, making nearby vineyards vulnerable to Pierce’s Disease and increasing the risk of the introduction of the Citrus Variegated Chlorosis strain of X. fastidiosa into the United States. Almond Leaf Scorch was a minor problem in California's almond orchards as it appeared only sporadically in the past, but now it is becoming a major concern. As H. coagulata continues to spread, researchers fear that Almond Leaf Scorch may also become more widespread throughout California (Carol 2000). Preventative measures: Currently, the best way to manage Xylella fastidiosa is to prevent the spread of its vectors and to detect and remove infected plants as early as possible. Special attention must be given to the landscape around agricultural areas because many ornamentals can be hosts for X. fastidiosa and show no symptoms of infection. Although no chemicals are currently registered in the US for treatment of Pierce’s Disease, landscapes and agricultural crops in high-risk areas should be treated with insecticides to prevent transmission by insects (Purcell 2001). UCANR (2003) reports that a broad-spectrum of antibiotic tetracycline is being tested for the treatment of Pierce’s Disease. 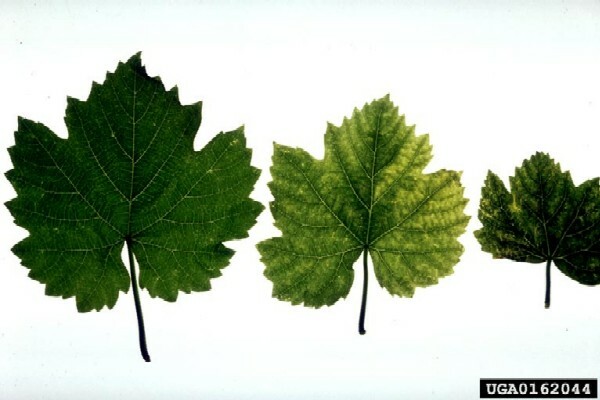 \r\nAnother University of California - Davis project is researching whether the infection of grapevines by X. fastidiosa can be prevented by raising the levels of essential plant bacterial micronutrients, such as zinc, iron, copper and molybdenum. Laboratory studies have established what concentrations are toxic to the bacterium and field trials are under way at UC Davis and in Temecula. These scientists are also looking at different methods of introducing the nutrients into vines, including foliar applications to leaves, tiny plastic screws inserted into vines, hand-held injection devices, and irrigation drip lines. Their strategy is to protect the plants against infection, rather than treat them after the fact. University of California scientists from Davis and Berkeley, in collaboration with colleagues from the University of Florida, are examining the effects of xylem chemistry on the spread of X. fastidiosa . The objective is to restrain the growth and colonization of the bacterium by changing the host plant’s chemistry. \r\nPhysical: Pruning is the major control method for Citrus Variegated Chlorosis in Brazil and has been effective in controlling Almond Leaf Scorch disease. However, early identification of infected branches is critical. Once the bacterium is widespread in a plant, pruning is not successful in controlling X. fastidiosa. Scientists have shown that early pruning also controls Pierce’s Disease in grapes, but the plants are not as productive following regeneration. Research is underway to determine how effective and costly this technique would be to the grape industry. \r\nBiological: According to UCANR (2003), scientists from the Berkeley, Davis, and Riverside campuses and Cooperative Extension county offices are evaluating new methods, including the use of other bacterial species and bacteriophages (viruses that attack bacteria), for control of X. fastidiosa in host plants. Informations on Xylella fastidiosa has been recorded for the following locations. Click on the name for additional informations. Liberato J R, Queiroz-Voltan, R B, Matsuoka K, Laranjeira F F & Miles A K 2006. Citrus variegated chlorosis (Xylella fastidiosa) Pest and Diseases Image Library. Updated on 1/10/2006 3:19:18 PM. Purcell, A. H. 2001. Xylella fastidosa Web Site. University of California at Berkeley. Summary: Detailed report on the vectors of transmission, host trees, impacts, management, and the different diseases caused by X. fastidiosa. UCANR (University of California Agricultural and Natural Resources). March 3, 2003. Report on Pierce s Disease Research and Emergancy Response Task Force. Summary: An article on management plans being implemented and future management plans being researched. Available from: http://danr.ucop.edu/news/speeches/bacterium.html [Accessed 27 March 2003]. USDA. 2005. News and Events: Scientists Seeking Biocontrols Against Sharpshooters. Alfredo Flores, Public Affairs Specialist, Agricultural Research Service of the U.S. Department of Agriculture. Campbell, Neil A., Reece, Jane B. and Mitchell, Lawrence G. 1999. Biology Fifth Edition . Addison Wesley Longman, Inc. Menlo Park, California. Summary: A biology text book. Used for bacteria reproduction info. Carol, Brenda. Dec 2, 2000. Almond Leaf Scorch Alert Sounded. Western Farm Press. Summary: An article on the effect of Homalodisca coagulate on the almond orchard industry. Available from: http://westernfarmpress.com/ar/farming_almond_leaf_scorch/index.htm [Accessed 26 March 2003]. Rawlings, N.D., O Brien, E. A. and Barrett, A.J. 2002. MEROPS: the protease database [Online database]. Nucleic Acids Res. 30: 343-346. USDA (United States Department of Agriculture). March 28, 2002 . Citrus and Coffee Strains of Xylella fastidiosa Induce Pierce s Disease in Grapevine. Agricultural Research Services. Summary: A brief publication on how Citrus strains of Xylella fastidiosa can produce Pierce s disease in Grapevines, while Pierce s disease cannot cause Citrus Variegated Chlorosis disease. It is available from: http://www.nps.ars.usda.gov/publications/publications.htm?SEQ_NO_115=133113 [Accessed 17 March 2003].